Abu Nasser Muhammad Abduz Zaher was born in a respectable Muslim family of Companygonj, Noakhali in the year 1948. He achieved his Masters Degree in English literature. He started his professional life with teaching at Khandaker Mosharrof Hossain Degree College in the early seventies. Later he joined at the Royal Embassy of Kingdom of Saudi Arabia in Dhaka, Bangladesh as the Secretary of the Embassy and Ambassador and performed duties for about 13 years. He joined The Ibn Sina Pharmaceutical Industry Ltd. in 1989 as Managing Director of the company. He is also a Founder Director of the Ibn Sina Pharmaceutical Industry Ltd.
Prof. Zaher is playing vital role in social welfare related works. He is related with founding and development of hundreds of educational institutions. He patronized to establish renowned private hospitals and helped thousands of people for treatment. He helped many poor people to avail housing facility, many poor students in their education and marriage of many poor brides. Prof. Zaher visited Saudi Arabia several times. He also visited many countries of the world including Kuwait, UAE, Bahrain, Egypt, USA, Canada, UK, Switzerland, Austria, France, Germany, Italy, Denmark, Greece, Mozambique, South Africa, Turkey, Pakistan, Nepal, India, Myanmar, Thailand, South Korea, Japan, Malaysia, and Singapore. He participated in many international seminars, symposiums and conferences at home and abroad. He was awarded by many local and foreign organizations as the recognition of his deeds in the field of socio-economic activities. About 40 years of experience in the Pharma industry, health service sectors and financial institutions. 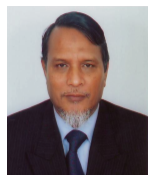 He is now the Chairman of Islamic Bank Bangladesh Ltd., Chairman of Islamic Banks Consultative Forum (IBCF), Vice Chairman of Bangladesh Association of Banks and Board Member of General Council for Islamic Banks & Financial Institutions (CIBAFI). He is a member of the Advisory Committee of the Bangladesh Association of Pharmaceutical Industries (BAPI).